Most of us have a limited amount of garden space. In order to maximize that space, it’s important that we grow as intensively as possible to get the most from our garden plots. There are several techniques that can be used to grow more intensively while allowing room for walkways and harvesting. The Wheel Hoe is a great tool for growing intensively because it requires minimal space to work between rows. As opposed to a gas-powered tiller or a tractor, the Wheel Hoe requires much less space to operate. Another great technique for intensive planting is double-row planting. Double-row planting, as the name suggests, involves planting two rows about 8″ apart. The double-row technique allows you to grow two rows in almost the same amount of space as one row would require. You can harvest either row from either side of the double-row, thus conserving space in your garden. As the plants grow and a foliage canopy develops between the double rows, you also get the benefit of reduced weed pressure. We like to use drip irrigation in conjunction with the double-row planting for maximal success. We bury the drip tape in our desired location and use the Hoss Garden Seeder to plant on both sides of the drip tape. We’ve experimented with double-row planting on many crops in our vegetable garden. It works well for onions, carrots, radishes, beets, okra, beans, peas and zinnias. It doesn’t work well for crops that require significant amount of space such as potatoes, squash, tomatoes, or for crops that require room for pollination such as corn. But for all of the other crops mentioned above, it is a proven method for maximizing the growing potential of your garden space. 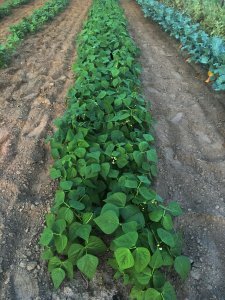 Here’s a great video showing how we perform double-row planting on bush beans in our vegetable garden.